On Monday, as PAX Prime 2013 was in the throes of its last day, I was able to talk to Nick Herman and Pierre Shorette, the co-director and writer respectively for Telltale’s The Wolf Among Us. The game is based on Bill Willingham‘s Fables comic book series and will take place before the events of the comic. Pierre: Have you played the demo yet? Me: I played it Friday. Pierre: What did you think? Me: I absolutely loved it! I am a big fan of the comics. Pierre: Obviously, we are hyper-critical about the response from people who actual know about Fables. So it’s great to hear what people have to say. Me: I haven’t gotten super-far into it, but I have read a decent chunk. Pierre: Sure, and it kinda echoes the first thread of the story that we are telling, too. Me: So, I am really curious why, after doing The Walking Dead and the huge success with that, why Fables? Nick: Uhm, I mean, actually, we signed the franchises at the same time, and so we were sort of, from the get go, just into it. Separate from the facts we signed [The Walking Dead], I think it’s just we were drawn to it because of the story and the storytelling that is available, like all these characters that everyone knows and the opportunity to tell a twisted version of that or, like, explore what they are like now with their own world. That is all just so interesting, and there is so much to do, so we picked it up and sort of ran with it. Me: So The Wolf Among Us takes place before the comic starts. Why the decision to start there? Pierre: Well, the challenge of making it canonical was important rather than to try and… Well, what we didn’t want to do was to make a game based on a movie where you just play through the movie. It’s not as interesting as part of the story experience. And there are people out there that actually know the story. But we also didn’t want to step on any land mines of breaking canon, and it is a lot harder—or easier—to do that in the middle of Bill’s work than it would be for us to sort of carve out a piece that sort of leads into it. Also, from our standpoint, it is awesome to be able to tell a story that might be a gateway for people to get into the comics. And although there are challenges, we definitely are in a place where, by the time you finish a story, you can pick up issue one of Fables, and you have had a prequel into this story. And just the opportunity to have the game, and then have a hundred -plus issues of comics right behind it to further enrich yourself in Bill’s world, is just really awesome. Me: Why the decision to go with Bigby as the main character? 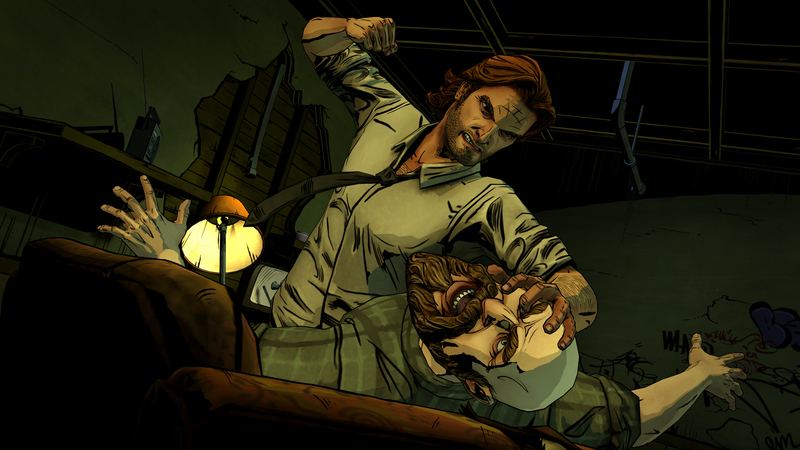 Pierre: Bigby is a really dynamic character that you could swing in different in ways because he has that rage. And that’s what we offer in our games: the opportunity to make “your” Bigby. So, for you to take the sort of soft approach to people or to be the guy who kicks the door down and demands answers, all that sort of remains within the frame of who Bigby is. So, he’s the guy that, as a vessel, allows us to be a player, and then to sort of personalize the character so you can sort of role-play as him and have different play experiences than other people. And I mean, just in general like, the sort of difference between… [Unfortunately, the background noises were too loud, and I was unable to catch a word or two.] …and like how he’s more powerful of a character. Nick: Yeah, I mean, really, he is sort of that use of power and knowing when it’s okay to be sort of maybe more aggressive. And knowing that, that might also affect your relationship with other characters. And it’s sort of like this story is how he copes with being the sheriff. He was the bad guy, and now he is supposed to be the good guy and learning how he should approach each situation. That’s up to the player to make it sort of feel the representations of those moments. Me: Who are some of the other characters seen throughout the game? Nick: You definitely see Bigby. Mr. Toad, you’re going to see. Pierre: Colin, which was a character that was awesome for us to be able to bring back because he meets his end kinda early in the comic series, and we think he is a rad character. It’s really nice to be able to have some more time with him. Nick: Those are a few. And there are obviously a lot more, but we can’t really talk about it. Me: When I played the demo, I really liked how, as opposed to when most people do a video game adaptation of a comic, you just end up fighting everything, with this, you really brought the character to life and pulled the player into it, too. Nick: I think, that’s what we sort of do as a company. We are always interested in the characters and the relationships and story… And even in the actual moments, there is still a lot for the player to create that story and the branching fight, and it really comes down to story for us. Pierre: And something like attributing something, I mean, something like a simple choice, like throwing someone into a sink or into a couch, is a story moment for a lot of people. And we are hearing feedback where people are talking about “Oh yeah, I threw him on the couch because I don’t want to be the bad guy—it’s soft on the couch.” I mean, being able to sort of fill in that space with your story and being able to create every moment with how you envision it and role-play, it’s the most important, and I think we are sort of taking it to the next step. Me: I guess it was a logical decision to animate the game the way you did, in a very comic/cel-shaded style. Nick: Oh yeah, the art team was on this game for a very long time making sure we could get this right. And I think once we were able to get it to look like the comics, we started to play with it and put our take on it. Even issue to issue in the comic book, the art looks different a lot of the times, depending on who is drawing it and what era they are in. We are a prequel, so we don’t know what era or time we are in. So, we played with colors and made things more vibrant and really contrasted the colors with the tone of the game. Me: For each of you, what was your favorite point in making the game? Pierre: For me, it’s definitely exploring the world that Bill has created and being a Fables fan and allowing us to sort of tell our own story within it. That’s so unique. When you are a fan of something and to be able to jump on and say, like, “Oh, what about this,” and for us to be able to do that and do that in that way… And, in addition, to see people who are Fables fans realize that we are making a game and just be so stoked that they get to see these static characters on a page come to life… That is really incredible. Nick: Yeah, I have a similar answer. My favorite point in making the game is probably now, in seeing everybody play it, because we have been working on it for so long, and that we were sort of numb to it, and we didn’t really know what we had until other people tell us. So seeing the fans of the game and people who have no idea even what Telltale is and what they are playing is phenomenal. Me: I haven’t seen the demo line shorter than wrapped around the corner of the whole convention. Pierre: We’re all surprised, honestly. We thought we were releasing this tiny game that maybe a couple people would be into, and it’s great to see that. I’m sure a ton of people played The Walking Dead and are just into what we do, and it’s cool because I think we are delivering on something that they will enjoy. Me: How is the game being released? Nick: It’s episodic, at first. So we are coming out in late September/early October with episode one, and that will be out on PlayStation 3, Xbox 360, PC and Mac, and then maybe some [other] platforms later. And then, we will be coming out semi-monthly-ish or as close as we can get to that, and then most likely, at the end of that, we will release a full retail disc. I thanked both Nick and Pierre more times than I could count for sharing their time with me. Now, go check out The Wolf Among Us, if you haven’t done so yet!